It feels like no public holiday is complete without its subsequent media scandal. Anzac Day is particularly fraught, considering the sensitivities around the day. Even though the post was quickly withdrawn and an apology issued, the backlash has lasted more than four days. It was enough to warrant a front page story on The Daily Telegraph, a call for Abdel-Magied's dismissal by the deputy prime minister and public repudiations by half a dozen government front benchers and several other politicians, including Pauline Hanson. It's ironic that the very politicians and commentators who constantly rail against political correctness are now apoplectic about a woman being politically incorrect. Free speech warriors like George Christensen are, seemingly without irony, calling for her to be silenced. The terrifying fury of the reaction is enough to make anybody shy away from anything but total patriotic observance of the day. Anything less, such as Abdel-Magied's post, is seen as 'deeply reprehensible' showing 'no love for Australia whatsoever'. Yassmin Abdel-Magied was free to make that Facebook post on Anzac Day, and politicians and columnists are free to express their displeasure. She apologised and withdrew the post. Nobody was arrested, charged or even sued, and so far nobody has lost their job or their platform to speak in future. That's what free speech is. Setting aside the fact that Manus and Nauru are not wholly separate issues from Australian military activity — many of those held in these facilities are from Afghanistan, Iraq and Syria — I'm willing to accept Mitch Fifield's assertion that 'Anzac Day is reserved as an occasion to honour the service and sacrifice of our men and women in uniform'. At its core, Abdel-Magied's post was lamenting violence done to innocent people in many parts of the world. The execution was inelegant, but given that Anzac Day is partially about the horror of violence and war, it's a sentiment not entirely incompatible with the day. "The campaign to remove Abdel-Magied from the national broadcaster and question her Australianness is a move to control what an Australian looks and sounds like." Does talking about harm done to others on a day designed to make us remember these things really constitute 'making political mileage' thereby 'demeaning our war heroes'? It's up for debate, but it doesn't seem like those denouncing Abdel-Magied want any discussion at all. It's a problem because the criticism directed at Abdel-Magied isn't just at her speech, it targets her very identity as an Australian citizen. The Telegraph article dwells on Abdel-Magied's Muslim faith at length, and the front page depicts her throwing what could be interpreted as a 'gang sign' drawing special attention to it with the headline 'TWO FINGER SALUTE' (incidentally, she is showing three fingers). It doesn't matter that she was the 2015 Queensland Young Australian of the Year or has been sent overseas by the government to promote our country. To the Daily Telegraph she is distinctly 'un-Australian' and so is ABC for continuing to employ her. It's not that criticising Abdel-Magied's post is inappropriate, it's that the pushback is so overwhelming it dampens the freedom of other people like her to explore what Anzac Day means in a public forum. Who would attempt to critique our Anzac observance now if it means having their identity called into question? This is significant because this year the government took the opportunity to leverage (dare I say, 'make political mileage from') Anzac Day to announce a new 'values test' as part of the citizenship requirements. So, naturally we ask, what are Australian values? The campaign to remove Abdel-Magied from the national broadcaster and question her Australianness is a move to control what an Australian looks and sounds like. It co-opts the discussion about shared values by narrowing what is possible. It shrinks the Australian national soul if we are dictated to by the government, or by Pauline Hanson, or by the Daily Telegraph about what is Australian and what isn't. At this point, Yassmin Abdel-Magied's initial post is irrelevant — the reaction is completely out of proportion to what happened. It's become a proxy for what kind of person is allowed to participate in the discourse about Anzac Day and Australian values. There is concern among social conservatives that they are being pushed out of public discourse on the basis of their politics, religion and identity. If we take their concerns seriously, then their outrage over one Facebook post by a young Muslim woman of colour appears even more farcical. Abdel-Magied represents a young, politically engaged generation of Australians who don't look and sound like the older media and political establishment which is now denouncing her. If she is excluded because she is 'un-Australian', then Australia is running the risk of becoming an exclusive club indeed. Rohan Salmond is a freelance journalist. He tweets at @RJSalmond and is the producer of Godbeat, a podcast about religion journalism. Do any of these politicians known any war veterans? If they did, they'd realise none of them would be offended by Yassmin's larrikin remarks! I suspect Joyce and Hanson are threatened by Yassmin's extremely broad ocker accent when she says "Australia-wide"! Thanks for a balanced, sensible and thoughtful article about this situation. Some of the responses by others were like vultures salivating on a corpse as if they were desperate for any opportunity to perpetuate their myths of fear. Yours however, was refreshing. Yassmin Abdel-Magied is a legend. I am very grateful for her actions. What she said is more honest than the maundering pap the white media vomit up. When I was her age nearly 40 years, Anzac was a day off school or work, a good footy match and getting a bit drunk as I got older. For heaven's sake, so many young people who think Gallipoli is a shrine think it's a shrine because we won some great big battle. As one of the silent majority of Australians who to this point has been accepting / programmed by the left to believe that we are to feel guilty for every injustice and as such have no right to express our opinions, I am reaching a point where I can no longer remain silent. There is a ground swell in the community unhappy about how Australia is being shaped and that the average Australian doesn't have the right to have their voice heard with out being called racist , politically incorrect etc. Freedom of speech is not a stand alone right for those on the left or the right. Core values of compassion and respect must also be honoured. The timing of her post damages her own agenda. For one given to silence, Ms Larwill should remember that the self-styled silent majority needs jolting out of its smug silencing of the voice of conscience on an issue that shows Australia up in a very bad light. Accordingly, there's little point in commemorating the dubious and, in historically comparative terms, accidental and disproportionate suffering of our boys in defense of an imperialist project in the long distant past, when we are the current collective perpetrators of a much more deliberate and intentional punitive violence on our doorstep. Dear Rohan, an excellent piece albeit I do not think YAM's comments were as innocently ill-conceived as you might suggest, somewhat underlined by the rapid removal of the post. Yasmin realizes she has a national platform and she made an attempt to hijack a national holiday day reserved for remembrance of Australians who have fallen in the theatre of war and replace it with her chosen social agenda. She is acutely aware of the potential force of the statement. Gauging the impact of such statements is, after all her profession. Happily Yasmin has 364 other days to pursue the issue of refugee policy. It's entirely reasonable that Australians demand this single day be reserved for the important reasons it was originally set aside. It is surprising that employees of the national broadcaster who owe their personal platforms to their employment at the ABC do not understand this. It did not offend me as it offended others but it still presents as an incredibly insensitive, dare I say, stupid error. A thought provoking article. Thank you. I agree wholeheartedly about the hypocrisy of demanding the freedom to display racism while denying other people the freedom to say anything. Going deeper, who has the right to decide what ANZAC means? Rohan, you say:"The execution was inelegant". What was inelegant about it? The racist response to Yassmin's comments are the same kind of comments that the moaners are complaining about. Thanks, Rohan, for your balanced overview of messy Australia. Those Australians who lost their lives at Gallipoli would be totally ashamed of politicians who incarcerate innocent asylum seekers on overseas hell-holes. They fought and died for freedom, not cruelty to innocent people. I thank Yassmin for at least raising this issue but I don't think we should downplay Anzac Day and all it stands for. Abdel-Magied was quite entitled to question 'Australian values' in the light of our deplorable display of values put forward in our name. Granted it could have been done more diplomatically, but a lot of the hype about Anzac day is nostalgia about the time we were all 'Little Britishers', instead of seeing it as a futile and tragic waste of young Australian and New Zealand lives at the incompetence of British planners. Perhaps it's time for a re-run of Alan Seymour's play, "The One Day of the Year", which I saw as a university student in the early sixties, and which addressed what Anzac Day was all about. Would it even get a run in these days of inflated self-righteousness? Well written Rohan. I am a Vietnam Vet and lost an uncle on the Somme battlefields in 1917. I was not offended by what Yassmin posted on social media on Anzac Day, although it was maybe not the right day to express it. Like most wars we have been involved in , including Vietnam, but excluding WW 11 where we were threatened , Australia's involvement has been at the behest of our "great and powerful friends". The politicians and others who attacked Yassmin have not been in war and can not comprehend its impact on those who have. Their response and that of the Daily Telegraph were very cheap shots at a Moslem and a women of colour. They DO OFFEND ME. I admire and support Yassmin for exercising her freedom to criticise a very inhuman response to people trying to escape from wars very much of our own making. Lets face it, the detention centres are "concentration camps", end argument! Thoughtful article. As you say ... YAM is free to post, and her position had merit. But the reaction has been bullying...and that, makes everyone afraid. Maybe it was meant to. On Good Friday, I remember the sacrifice Jesus made for us. On Anzac Day I pause and remember the death of my great uncle and others who died at Gallipoli. These days are sacred to me. No one tells me what either day means. These are my chosen positions. It doesn't mean others have to believe the same , but I feel slighted when another Person disparages these days by diverting the essence of the days to something else. Politicians have been using ANZAC Day for their own purposes for decades but that's okay if you do it to support the status quo. It is a day to reflect on sacrifice and loss, on bravery in the face of danger and on the uselessness of war. Sixty thousand dead Australians in the "Great War" alone. We should never forget. If as the RSL says, the price of liberty is eternal vigilance then surely the point of liberty is the freedom to speak out. If we can only say "respectable" or "sensitive" things on ANZAC Day then that defeats the purpose of the sacrifice that we genuinely should remember. It seems to me Yassmin Abdiel-Magied's critics were all too ready to find a place to vent their outrage and she provided a convenient target on a number of levels. Her critics also have the right to speak out but the over-the-top responses say a lot as well. Fiona's cartoon "The Soldier of Misfortune" made a related point. As far as I can see it hasn't been criticised at all but perhaps they just haven't focused on it yet. Don't be silenced by the critics Yassmin, keep speaking up. I constantly marvel that the far right’s free-speech warriors so frequently work themselves into righteous lathers about anyone daring to publicly express opinions contrary to their own ‘Australian Values’. Most especially if the 'offenders' do so as independent citizens and not members of a political party. Correct me if I’m wrong, but I thought that was what democracy and free speech were all about? Not for all, eh? It’s ironic that those who loudly and often proclaim their right to say whatever they like to or about whomever they like seem so eager to completely silence anyone not parroting the same political ideology. Including democratic citizen-initiatives like GetUp, made up of people of all political persuasions, whose internal voting determine what issues GetUp pursues. Are our Righteous Champions suffering cognitive dissonance? A deficit of education? Or reasoning or empathy? Or is something rather less innocent at work? To solve our problems, we need to stop closing our ears, and actually listen to those with different opinions to ourselves in civil discussion. Then we might actually learn something and find a way forward. God knows, our politicians have never been so inept or disinterested in doing that for us. Listen/listen, win/win. Justin. Going deeper still : "We do not see things as they are, we see them as we are". I too must be unAustralian as I dread the hypocrisy of Anzac Day. But it's more than that. Never a week goes by than we a marking the anniversary of some battle or other. I strongly object to the militarisation of our society. But heaven forbid that I utter this in the current climate of political correctness. It's predictable that those who protested the loudest are the very same people who sow the seeds of hate and distort the true meaning of Anzac. The many who died, did so for the sake of peace, not for glorifying the act of war. Yasmin Abdel-Magied simply gives meaning to its memory. And that includes the plights of holocaust victims as well as those who are imprisoned in detention centres for being asylum seekers. I think we should be more concerned with the likes of Hanson, Abetz, Christensen et al who'd march under the banners of intolerance and claim to be true Anzacs. I remember too well the images of people like them marching under banners not that long ago. Whether Yasmin's tweet was prophetic or just hasty and ill- thought, is irrelevant. She's an Australian, and Australia values and affirms freedom of speech. Of course freedom of speech has boundaries, but she didn't cross them. We all have to learn to cop it sweet at times when someone says something we disagree with. That's Australian. Brilliant article! Yassmin has not done a thing wrong. The argument against her has become so exaggerated that it is now symbolic. This is a point where we either allow conservative nationalists to claim power that is not theirs or we stand up for justice and wonderful young people like Yassmin. I expect my many ancestors and relatives who fought in wars (including Gallipoli) would stand by Yassmin and her right to free speech. We must not let misinformed nationalism win. The 20th century has shown us what happens when good people stay silent when confronted by right wing nationalism. Anzac Day is for all Australians. Of course, YA-M was free to state what she did, and it is worth our while to remember the 'forgotten people' in Manus, Nauru, Syria, Palestine etc. But it is not so much the exercise of her freedom that offends but her lack of sensitivity in choosing to say what she did on Anzac Day. The 2015 Queensland Young Australian of the Year could not have been unaware that she would be provocative. Patrick and Celia ..... two lone voices (opinions) I have to agree with. Thank you! You can't look at the push back at YAM Anzac post in isolation to understand the ill will she has created. She got into a argument with Jackie Lambie on Q&A about sharia law and Islam being a feminist religion. Then a Muslim collective created a petition on getup, supported by smh, calling on the abc to apologise for the hurt Lambie's comments causes the Muslim community. A right wing blog upped the ante and created other petition calling on YAM to be sacked which got more support. Her Anzac comments only add to the ill will towards her in parts of the community. If you want to someone to show that Muslim can contribute you need someone like Waleed Aly not YAM. I found Yassmin's comments patiicularly appropriate to ANZAC Day, a day when we should reflect upon the great issues of injustice, oppression and freedom, and when we might well comment upon the failure of political leadership to uphold the values that many Australians hold dear. Yassmin is both right and wrong. She makes no distinction between the past and the present. Anzac day symbolises a hard won freedom for Australians at a time we were threatened from without, not from within. Patriotic fervour burned in the hearts of the Anzacs who answered the call from our ally, Great Britain, with whom we still share a monarch. But what triggered WW1? " on a street corner in Sarajevo, Gavrilo Princip fired the shot that started World War I when he killed Archduke Franz Ferdinand. The shooting acted as a trigger, metastasizing from a Balkan street corner into a continental crisis by releasing pent-up tension between rival blocs of Great European Powers: the Austro-Hungarian Empire and Germany on one side and France, Russia and Great Britain on the other." Tim Butcher CNN June 29, 2014. 17 million people died and we cannot ignore their sacrifice or compare the events of that war with Nauru, Manus, Syria and Palestine. Nauru and Manus are a disgrace to be laid squarely on the shoulders of our politicians. Syria is an allied military effort to rid the world of ISIS. Was Yasmin indirectly supporting them by her snide remarks? I wonder. Who would criticize ANZAC Day now? ME I don't let the family join those school things now and I say, lest we forget all of them including Manus, Naru and all these things politicians have done on our behalf without our permission. My respect to those who died but...Go Abdel Magied ! So even if the criticisms of Yassmin's comment are fair, the response, mostly from conservative politicians, news corp and various righties on social media has been disproportionate and it's been cruel. ANZAC day branding, Wet T-Shirt contests and Alcohol seemingly form blips on the radar compared the flashpoint of controversy Yassmin's comment has generated. Certainly I do not recall anything in the Daily Tele (not that I read that tabloid) condemning Woolworths or business trading in sexualised imagery let alone calling it a "two fingered salute" yet such condemnation one would think would be more readily applied to said businesses. Nor do I recall any Liberal Party politicians condemning former ACL MD Jim Wallace for invoke ANZAC day in a homophobic tweet back in 2011, let alone calls for "self deportation." Wallace said "Just hope that as we remember Servicemen and women today we remember the Australia they fought for - wasn't gay marriage and Islamic!" The simply reason for this is that conservative Australia is less interested in ANZAC day itself and more in an excuse to bash a Migrant, Muslim woman of colour who works for the ABC. 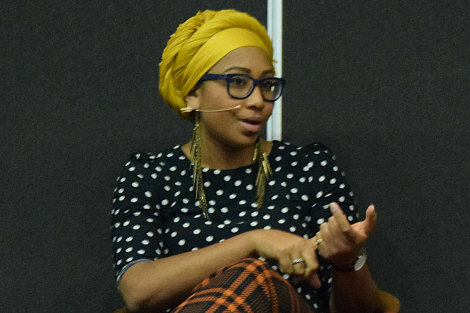 I support Yassmin Abdel-Magied saying Lest We Forget and I think I have the right to say this: My Grandfather was in the 1st wave at Gallipoli, my Great Uncle was wounded at Gallipolli and on The Somme, my father was wounded at Tobruk, my uncle died on the Burma Railway and I did 2 tours of Vietnam. She is Australian. "so far nobody has lost their job or their platform to speak in future" a few weeks later and YAM HAS lost her job - despite weird mumblings from the ABC about "restructuring" programming and "using her talents elsewhere". No more "Australia Wide" to be presented by YAM. The Uglies who would control our lives have won again. How sad. The saddest part is that many of them have NO idea of the future they are casting for us and our country through their narrow, biased view of the world.